Province of Canada stamps were among the first adhesive postage stamps to be issued by the British colonies in North America. The Province of Canada was formed as a result of the Union Act of 1840. The new province consisted of the former North American provinces of Lower Canada and Upper Canada. Upper Canada occupied the southern border of modern Ontario along the St. Lawrence River. Lower Canada occupied the Southern and Eastern borders of modern day Quebec along the St. Lawrence River, and part of Labrador. These two combined territories were known as the United Province of Canada or United Canada. Between the northern borders of the Province of Canada and Hudson Bay at that time was Rupert's Land, part of the Hudson Bay Company. Beaver Building a Dam. One of the early symbols of Canada, the beaver is a nocturnal animal that builds dams to create ponds that provide protection against its predators and to provide easy access to food sources during the Winter months. Prince Consort Albert. (Lived 1819-1861, Consort 1840-1861). Queen Victoria. (Lived 1819-1901, Reigned 1837-1901). Jacques Cartier. (Lived 1491-1557). French explorer and the first European to map the Gulf of St. Lawrence and the St. Lawrence River (1534-1542). He claimed the territory for France, calling it "Canada", after the Iroquois Indian word "kanata", meaning "village" or "settlement". The three Province of Canada stamps shown above were issued in 1851. They are imperforate and are printed on laid paper. 3 P. (1851 - Scott #1) - Red, Orange Vermilion. 6 P. (1851 - Scott #2) - Slate Violet, Grayish Purple. 12 P. (1851 - Scott #3) - Black. The Black postage stamp, with the profile of Queen Victoria, was denominated as 12 Pence, instead of 1 Shilling, due to varying exchange rates for the Shilling in North America. Approximately 51,000 of these Province of Canada stamps were printed by Rawdon, Wright, Hatch & Edson of New York City. They were never popular, as the poor quality vertically laid paper annoyed both postal officials and the public, and there was little demand for a stamp of this denomination. The gum on the laid paper stamps did not adhere well to envelopes, which often required their being glued to the envelope. The 3 Pence and 6 Pence denomination Canada stamps were later re-issued on good quality wove paper, but no further printings were ever made of the 12 Pence denomination. During the six years that the 12 Pence stamp was in use, only 1,450 of them were sold. The remaining 49,550 stamps were destroyed. Today, it is estimated that about 100-150 of these stamps still exist. The 3 P. and 6 P. denomination stamps were reissued between 1852 and 1857. They are imperforate and are printed on wove paper. 3 P. (1852 - Regular Paper - Scott #4) - Red, Brown Red. 3 P. (1852 - Thin Paper - Scott #4d) - Red, Brown Red. 6 P. (1855 - Regular Paper - Scott #5) - Slate Gray, Brownish Gray, Greenish Gray. 6 P. (1857 - Thick Hard Paper - Scott #5d) - Gray Violet. The 6 P. denomination was reissued in 1857 on very thick, soft, wove paper. These stamps are easily damaged, if mishandled. 6 P. (1857 - Thick Soft Paper - Scott #10) - Reddish Purple. Where is Scott #6 ?? It was once thought that the 12 P. denomination had been produced on wove paper (Scott #6). It is now believed that this was never true, and no authenticated examples have ever been found. The 10 P. denomination Canada stamp shown above was issued in 1855. The stamp is imperforate, and it was produced on both regular wove paper and thick wove paper. The thick paper stamps are the more expensive of the two varieties. The 1/2 P. and 6 P. denomination stamps shown above were issued in 1857. They are imperforate and printed on wove paper of normal thickness. The 1/2 P. denomination stamp also exists on varying types of ribbed paper, and these stamps are very rare. 10 P. (1855 - Scott #7) - Blue. 1/2 P. (1857 - Scott #8) - Rose. 6 P. (1857 - Scott #9) - Green, Deep Green. Between 1858 and 1859, the first perforated Province of Canada stamps appeared. These stamps are all perforated 12. 1/2 P. (1858 - Scott #11) - Rose. 3 P. (1858 - Scott #12) - Red. 6 P. (1859 - Scott #13) - Brown Violet, Gray Violet. In 1857, the decision was made to abandon the British Pound Sterling currency in favor of a new decimal currency, based on the United States Dollar. The change to the new Canadian Dollar took place in 1859, though the British Gold Sovereign (Pound) still remained legal tender there. The first decimal currency stamps of the Province of Canada were issued between 1859 and 1864. They are all shown above. The designs are the same as those of previous issues, but the stamp denominations are different. 1 C. (1859 - Scott #14) - Rose, Deep Rose. 2 C. (1864 - Scott #20) - Rose, Deep Claret Rose. 5 C. (1859 - Scott #15) - Vermilion, Brick Red. 10 C. (1859 - Scott #16) - Black Brown. 10 C. (1859 - Scott #17) - Red Lilac, Violet, Brown, Deep Red Purple. 12 1/2 C. (1859 - Scott #18) - Yellow Green, Blue Green. 17 C. (1859 - Scott #19) - Blue, Slate Blue. The Province of Canada joined the Canadian Confederation on July 1, 1867. 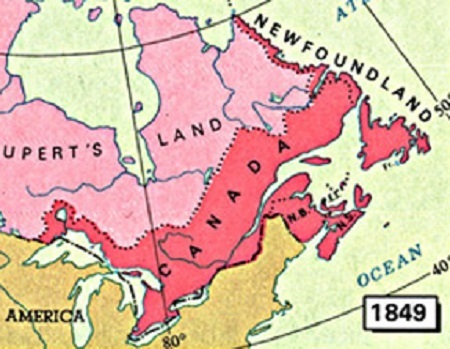 The Province of Canada was split into its former geopolitical divisions, with Upper Canada becoming Ontario and with Lower Canada becoming Quebec. This resulted in the creation of the first two provinces (or states) of the newly established Dominion of Canada. At least in the author's opinion, one of the most beautiful Canadian stamps ever produced is the 12 Pence denomination stamp issued in 1851. Unfortunately, it is pretty much unobtainable these days. The 2015 Scott values for the stamp are $175,000 (mint) and $140,000 (used). There is hope though! The stamp shown above is Canada Scott #3 -- with a vertical "SPECIMEN" overprint in red. These are much more obtainable than the original stamps issued at post offices in the Province of Canada. The beautiful stamp shown above can be obtained for about the price of a mortgage payment (around $1,600), instead of the price of one's house! With a little bit of financial suffering, many Canadian collectors could eventually own one of these without going completely bankrupt in the process!